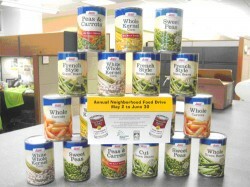 As part of its Neighborhood Food Drive, Marquette Bank will be collecting non-perishable food items at all 23 bank locations between May 2 and June 30, 2013. Marquette Bank, a locally-owned neighborhood bank, is launching its 6th annual Neighborhood Food Drive on May 2, 2013. Bank employees, customers, neighbors and local businesses are encouraged to donate non-perishable food items at any of Marquette Bank’s 23 locations or to make an online donation. Food items will be collected through June 30, 2013 and distributed to local pantries and neighborhood food banks through the Greater Chicago Food Depository (GCFD) and the Northern Illinois Food Bank (NIFB). Bank employees will also be spending several days volunteering at the GCFD by sorting and packing donated food items. The Neighborhood Food Drive is a part of the Marquette Neighborhood Commitment, where each quarter the bank focuses on a different area of need: shelter, hunger, education and health/wellness. To find out how you can help the GCFD, go to www.chicagofoodbank.org and visit www.northernilfoodbank.org for information on how to assist the NIFB. For more information about Marquette Bank, call 1-888-254-9500 or visit www.emarquettebank.com/fighthunger.